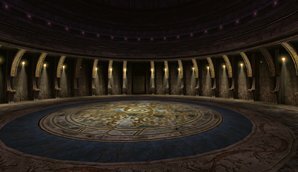 This version of the Uru Glossary contains the items from Myst Online - Uru Live, 2007-2008, and the new revival, February 2010. In the latter two shards you can play on-line MOUL as well as the fan created Ages. uru live,moulThere are several names, terms and expressions used in Uru (many of them originating from the slang of the early explorers), which are unknown to new adventurers. To help them we have created this brief glossary. We are aware that some spoiling is inevitable, however, we have tried to keep this to a minimum. Items in pink are basic terms in the game. Items in light green color are referred to as OOC. Apart from some basic information regarding the DRC and its members, Uru Glossary is not dealing with the IC RPG storyline in detail. You may read about those events in the Uru Live or other forums. As MOUL has practically become an "abandonware", no further maintanance of the content of this glossary is planned. Use it as it is. Ae'gura The biggest and highest island in the huge lake of D'ni, part of the city. For the time being, explorers are allowed to move only in this district. Ae'gura has several instances. Ahnonay Age Four in one or one in four? An Age created by Master Kadish with an interesting island around a clocklike device... and much more. Antechamber room or Great Zero Observation. Your first visit to the Great Zero starts in this small room. The Bahros For the time being, little is known about these non-human "beast people", Yeesha calls them the "Least". They were probably the inhabitants of the cave system before the arrival of the D'ni. Although they are intelligent creatures, the D'ni treated them as animals only. 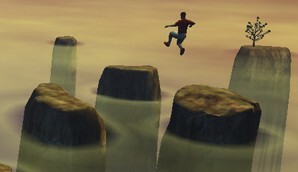 You can see them in the endgame of Yeesha's quest at the rim of the crater. (You can learn about the connections of the Bahro and the D'ni a lot more in Myst V: End of Ages.) Recently occassional Bahro appearances were reported from the city. Bahro Caves By collecting all of the Journey cloths of the basic Ages or solving puzzles in others, you can open and enter the Journey doors or Spiral doors or portal lights and link to a Bahro Cave, where different items can be found. Their exact physical place within D'ni is still a controversial issue (part of them are embedded in the cavern ceiling above the D'ni lake). They can mysteriously change their appearance. Bahro caves were probably the past dwelling places of the Bahros. Bahro Pillars These pillars, which resemble totems, are found in a Bahro cave and play a central role in your primary Uru quest (Yeesha's quest). Bahro Stones 1) Linking cloths mounted on a stone slab. These usually give access only to a separate part of an Age (a room or a balcony etc). 2) A big chunk of stone in a balcony of the Neighborhood. Several glyphs can be seen on it. They are clues on how to complete your primal exploration in the basic Ages of Uru (Yeesha's quest). Bevin Originally the name of a particular Neighborhood. Nowadays its meaning has shifted and is generally used in place of Neighborhood. Bone cage Found in the Minkata Age. Cage ball A sport of the explorers in the Minkata Age. Calendar lanterns These stone lanterns with tiny sparkling lights might appear on the calendar stone at Relto. Cannen The cannen is a music recording device invented by Gehn. Canyon The deep fiord in the city, right downstairs from the courtyard, on the way to the Concert Hall. 2) The accesible part of Er'cana. Cate Alexander A former member of the DRC. She organized the raising of funds for the DRC and the new restoration work at the cavern and the Ages. At June 2007 she was elected to the Council to replace Michael Engberg, but she resigned and left next year. Cavern 'Cavern' includes everything in the vast cave of D'ni: the city, Ae'gura, the Neighborhoods, the Great Zero etc. Classroom Located in the Neighborhood. One of the first places to visit. Cleft One of the first places to visit and explore. A crack in a desert at the foot of a dormant volcano at the Earth, the one-time dwelling of Ti'ana, Gehn, Atrus and Yeesha. Clock 1) The huge D'ni clock can be found in several Neighborhoods; 2) An important big clock-like device in Ahnonay. Not a radar and not a clock but something between. Control rooms They can be found in Gahreesen Training Center. Dereno An arctical pod with interesting underwater life and ice harps surrounding it. D'ni Riltagamin The desert and the cleft are called by this name, in fact, it means probably the unknown parts of the Earth Age (from the D'nis' point of view). D'ni Tiwah The newer name of the Great Shaft and the Descent. DRC Acronym for D'ni Restoration Council (archived old site). Its main purpose was to oversee the exploration and restoration of D'ni. The council was headed by Dr. Marie Sutherland, Dr. Ikuro Kodama, Victor Laxman, and Michael Engberg with Dr. Richard Watson as chair. In February, 2004, all restoration efforts were cancelled and the cavern was evacuated and closed. The DRC began showing renewed signs of activity in February, 2006 and returned to the cave a year later in 2007. Cate Alexander has become an associated member in 2007 and later replaced Watson in the Council. There were also numerous volunteers who served in support roles. (Characters) The members of the DRC may appear in Uru Live. Eder Delin Age A peaceful Garden Age with a Spiral Door, you can enjoy the everlasting dawn there. Eder Kemo Age One of the Garden Ages, the beautiful sister age of Eder Gira, every now and then with heavy storms. Eder Tsogal Age One of the beautiful Garden Ages with small ponds and swaying grass around, not to speak of a Spiral Door. Egg room Located in the Neighborhood. Its purpose is still debated in spite of the several expeditions made by the early explorers. The Egg room is not always open. Around the "egg" there are Private rooms. Engberg, Michael Michael Engberg, former member of the DRC, was an expert in architectural structure and history, and was in charge of the physical restoration process in D'ni. After the tragic death of his daughter Willow he disappeared from the cavern. Engberg, Willow 'Wheely' Wheely was the teenage daughter of Michael Engberg. She appeared in the cavern every now and then. Wheely and her friend Rose died in a tragic cave-in accident in May, 2007. Er'cana Age The Age with a big industrial complex in a now barren canyon. One of the food producing Ages of the D'ni. Garden Ages The Ages Eder Kemo, Eder Delin and Eder Tsogal. Gazebo or pavillion. Resting places with benches in the Garden Ages. Great Shaft A huge well that rises straight up toward the surface with stairs spiraling up along its sides. Part of the unfinished way to the surface, build by the D'ni a few hundreds years ago. Great Zero Observation (GZO) or antechamber room. Your first visit to the Great Zero starts in this small room. Greetmart Nickname of the Greeters' Neighborhood. Guild Hall The centre of the ancient D'ni Guilds. The large building you see in front of you and high above the Tokotah courtyard, in the mountain, when you walk up the Great Stairs in the city. Currently under restauration, not available to visitors, its entrance is behind the great curtain at the Tokotah courtyard. Guild of Greeters A group that has dedicated itself to helping new explorers get oriented as they begin their explorations. The Guild of Greeters is a team of the friendliest and most knowledgeable explorers around. You may find them in the Guild of Greeters neighborhood and usually wear a cyan T-shirt. (Unfortunately, quite rarely nowadays.) Also they are available via their forum or live chat. Guild of Writers The Guild of Writers are a group of talented people creating new fan Ages which can be played offline with Uru CC or TPOTS or online on a few shards. Guilds The one-time D'ni society based on the subtle system of the 18 major Guilds (Guild of Writers, Maintainers, Miners, Book-makers, etc.) and numerous minor Guilds. Government, education, culture, science etc., even everyday life were strongly influenced and interwoven by the Guilds. Recently the DRC encourages the formation of a somewhat similar guild organization of the explorers Kirel. Guild Pubs Community places of the recently formed new Guilds of explorers. Only supporters or members of the Guilds can reach the appropriate pub. Henderson, Phil "phend" Originally Phil Henderson was a Restoration Engineer working with the DRC, but later after a mysterious long journey he was abducted by the DRC, and he had contact mainly with Sharper only. He appeared to die in a cave-in accident in the city in December, 2003. His body has never been found. Surprisingly, Phil returned to the cavern in August, 2007. Imager A device for displaying images and messages at different places. You can place images or messages to the imager at your Relto or in your Neighborhood, others are available only for the DRC. Instance Relto itself and the Books on your Relto bookshelf are your personal copies, instances of the Ages. Entering the city via the brown City Book you get to a hood instance. Players in different instances of the same Age will not see or hear each other. Think of these instances merely as "parallel worlds". (OOC: city instances are used because of technical reasons in order to avoid high density of population. Its IC explanation is quite forced.) When Books or bahro stones leading to the cavern are shared with another player instancing is an obscured and messed up process. Jalak Dador Age An Age with an arena dedicated for some kind of D'ni sport or competition. Journey cloth A piece of tapestry-like cloth with a stylized hand on it. All of them are to be collected in each basic age. They are used as bookmarks in these Ages as well. Sometimes referred to as Journey hand . cf. Spiral cloth and Shell cloth. Journey door These massive doorways, one in every basic Age and bearing the same hand marking as the journey cloths, lead to the Bahro cave. To open them, you have to collect all of the journey cloths in that particular age. Sometimes referred to as Yeesha doors. cf. Spiral door. Kadish Gallery A separate hall in the city, available via a linking book, too. The magnificent stained glasses on the walls may contain clues to the puzzles of the Kadish Age. Kadish's quarter or office. The one-time hidden place of good old Master Kadish in Ahnonay. Kadish Tolesa Age This Age of gigantic trees was once created by Guildmaster Kadish to hide a cache (vault) in its secret caves. To access the cache, several puzzles have to be solved. KI The wristwatch-sized D'ni communicator. It is a must for every explorer in Uru. You can take pictures with it, send messages or pictures, after calibration it shows the D'ni position coordinates. KI guides: at GoG and at OpenUru. KI calibration marker maps Mark_AF's original maps of URU marker games necessary for entering the Great Zero and the calibration of the KI. Spoiler! Kirel This bluish colored place is one of the Neighborhoods. For the time being, it is the centre of the new Guilds founded by the explorers. Library The magnificant building of the Great Library is at the far end of Ae'gura. Do not confuse it with the rooftop office (workshop) at the Tokotah building 2) A small hall in Myst island, where the library of Atrus was many years ago. Light meter Currently under repair. It could be found in the City at the dock area. It measured the light emitted by the luminescent algae of the great D'ni lake. Maintainers' Nexus Part of the Wall. Currently not available. Maintainers' suit The special armour-like suit was worn in dangerous situations or in the test area. Available from Gahreesen. Maintenance exit (tunnel) leads to the Maintenance rooms. Maintenance rooms An important place in Ahnonay, accessible only with difficulty. Sometimes referred to as mech(anical) room or simply as 'control area' or 'control room', although there are several other 'control rooms' in Uru. Marker The white disk shaped pulsating markers are used 1) in the KI calibration procedure (green, red or yellow marker missions); 2) in the marker games as it is written in a notebook in the Training center. Memorial Imager This memorial is for those who have fallen and it can be found in the City in the Pub hallway. Minkata Age The Age with an endless dusty desert and some artifacts of the aboriginals. MOUL Acronym for Myst Online - Uru Live. Museum A building near the Tokotah courtyard, Ae'gura. It is certainly worth visiting because of the books and documents available there. Myst Age Yes, the well known Myst island, the now abandoned homestead of Atrus and Catherine is available (partially) again from a remote spot of the cavern! Negilahn A tropical pod with lush vegetation and strange animals around (urwin, two-tailed monkey, etc.). Neighborhood (Nowadays often "Bevin") An outlying section of D'ni. The Neighborhoods are situated in the cavern walls of D'ni. They are excellent places for social activities of a larger group of people. Neighborhoods vary in their equipment and décor. 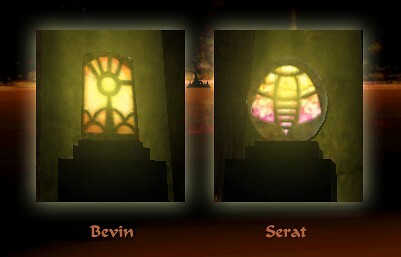 There are three basic types, Bevin (common) and Serat (rare), distinguishable mainly by the shape of their lamps. Kirel is a mirrored hood with different colouring and tiling They are shared by several players, new ones can be created and the players can change their membership. New Greeters The New Greeters were founded in 2011 to provide better support for new players in the many incarnations of Uru Live. Nexus Age Nexus is a kind of personal central terminal or station. It contains all of the available links within the cavern. The Nexus linking mechanism cannot be used without the KI. Observation room 1) Antechamber room of the Great Zero (sometimes called observationdeck); 2) Sometimes the Control room of the Wall in Gahreesen Training center. Pavilion or gazebo. Resting places with benches in the Garden Ages. Payiferen A desert pod with neverending sandstorms outside. Private rooms Five soundproof small rooms around the Egg room for private conversations. Pub 1) The one-time tavern in the harbor of Ae'gura, by the side of the main stairs. 2) The Watcher's Pub Sanctuary. 3) Guild Pubs. Relto Linking Book The special linking book attached to the explorers' belt. By using it you return immediataly to your own Relto. You can share your Relto book with others, by clicking on the "Share book" on the left side of your Relto book and then with the open book cursor clicking on the avatar you are inviting. Relto pages Pieces of paper you find lying around (1-2 per ages). They add a page to your Relto linking book and add the feature pictured to your Relto, i.e. a waterfall, a dock, etc. Sometimes referred to as Yeesha pages or Treasure pages. Some pages are available only intermittently. ResEng Restoration Engeeners of the DRC, who are very helpful in the case of problems. Sanctuary A secret place in the city, available through the Nexus only. The ancient meeting place of the Watcher and his followers. Referred to as the Great Tree Pub or the Watcher's Pub as well. Sandy Sandy the football is lurking deep in the Minkata desert. Sandscrit A rarely seen large, flightless birdlike creature. Sandscrits live in the desert of the pod age Payiferen. Shell cloth In the Er'cana and Ahnonay Ages the journey cloths have a shell on them. Sparkly (sparkle, sparkie) A strange small sparkling and swaying light found at different places intermittently. They influence the calendar stone at Relto. Do not mix it with the fire-marbles. Spiral door Found in certain garden Ages, they lead to the Bahro caves. The teamwork of several explorers is needed to open them. Spiral cloth Found in certain garden Ages, their skilful manipulation opens the spiral doors. Spy room A small hidden place in the city. Douglas Sharper and Phil Henderson used it to spy through a telescope on the Tokotah office of the DRC. Tetsonot A broken down pod. Tokotah Buildings I and II They are found at the upper end of the Great Stairs in the city, on the Tokotah Alley and Courtyard. Building I is behind the DRC tent, building II is opposite to it, above the Nexus station. It has a makeshift office on the roof, sometimes referred to as DRC office, workshop or library, available only through the appropriate linking book. An alternative old spelling is Dakotah. Two-tailed monkey They live in the jungle at the Negilahn pod. Urwin A large, flightless bird. Urwins live in the jungle of the pod age. Vault The place of the last puzzle in the Kadish Age. Wall Massive training and testing facilities in the huge central hall of the Gahreesen Training Center. You may glance at it from the Conference or Control rooms. Currently it is out of order. Well The structure resembling to a stone well at Relto. Wellstones (wedges) The rotating stones over the Relto well, obtained piece by piece when fulfilling different tasks. For the time being, their purpose is unknown. White, Nick Nick was a Restoration Enginer. He started to learn D'ni in 1998 and translated many D'ni documents to English. After coming into conflicts with the DRC he left the Council in May, 2007. Zandoni One of the easter eggs in the rainy desert. More additional info can be found in the archives of Guild of Greeters, D'ni Pedia Writers, MYSTlore wiki, Wikipedia (Myst franchise), Wikipedia (Uru), Uru Obsession, Myst wiki, The Guild of Archivists, Myst Ages, (and on many other sites as well). Bear in mind, however, that usually the more detailed the info the more you are spoiled. The above list is obviously not full, it will be enhanced as the game evolves. We hope that it will help you in your Uru quest!